Designer Lisa Ward, custom lighting studio Lite Brite Neon, and Epicenter created two neon signs for Green River, Utah. Maria Sykes managed the project. Winter in Green River is typically a time to hunker down by the fire at home. You can rarely find residents venturing outdoors in the Winter at night, except maybe en route to a Green River basketball game. (Go Pirates!) This year was a different story, though, as Epicenter in partnership with the City of Green River, hosted the first annual “Ignite the Night” on South Broadway in Green River to bring people together and celebrate the unveiling of new lighted signs on Main Street. The evening got started with a bang! Quite a few bangs, actually: a custom fireworks display by Marisa Frantz and Lisa Ward. The display began as a slow-burning fuse that set off a highly-anticipated series of events that could best be described as a pyrotechnic Rube Goldberg machine. Though the fireworks were seen and heard for miles, up-close was the real show. 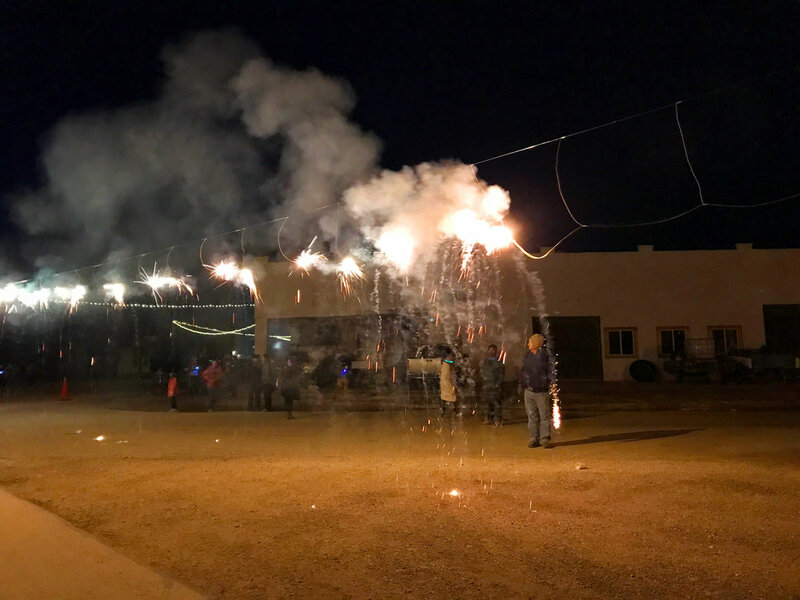 The team had rigged up an elaborate “ladder” of sparkling fuses hung over the street that led to an unlit bonfire in front of the Green River Fire Department. Once the bonfire erupted into flames, the team celebrated the successful chain reaction alongside an audience of over 60 spectators. The bonfire lighting signaled that it was time for s’mores, chili, hot cocoa, and a live music performance by Clive Romney and friends at the Green River Firehouse. Clive Romney, Executive Director of Utah Pioneer Heritage Arts, was joined by Hank Mason and Jana Wells of Grand Junction, Colorado. They sang original songs of Utah’s rural heritage, pioneers, and folktales. Armed with glow-bracelets and LED accessories, the all-ages audience swelled to over 80 participants who danced and sang along with the musicians.